Because you can also buy a pillow while shopping for your shirt or shoes! Shopping can be both rewarding and tiring at the same time, especially when you have to run around different places. But if you're pressed for time, these stores let you shop for your home and wardrobe needs without the hassle. Penguin has been known for decades for their comfortable and timeless sports wear. The popular US brand has recently opened a concept store at the new wing of Power Plant Mall. 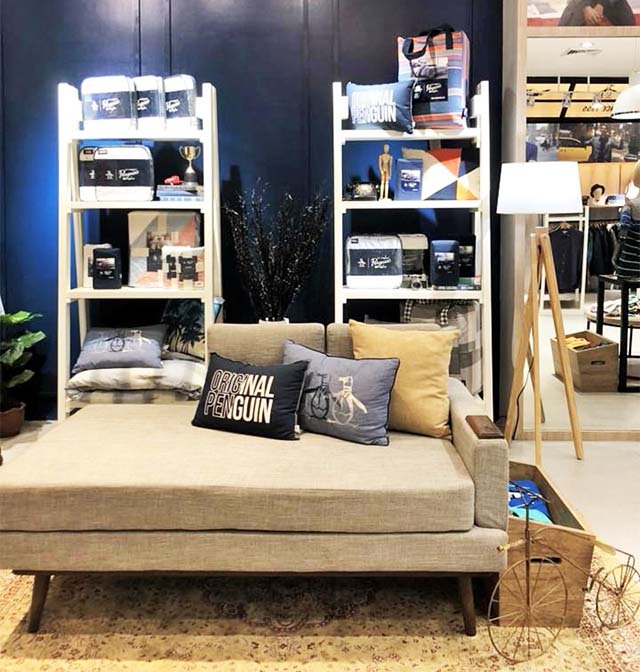 We love the new store not only because it was designed by fave RL designer Wilmer Lopez, and the fact that it has a full-service barbershop Hey Handsome, but because it also carries a limited edition line of home accessories, travel items, and bed linen. There’s a section within the store that is dedicated to their home line. 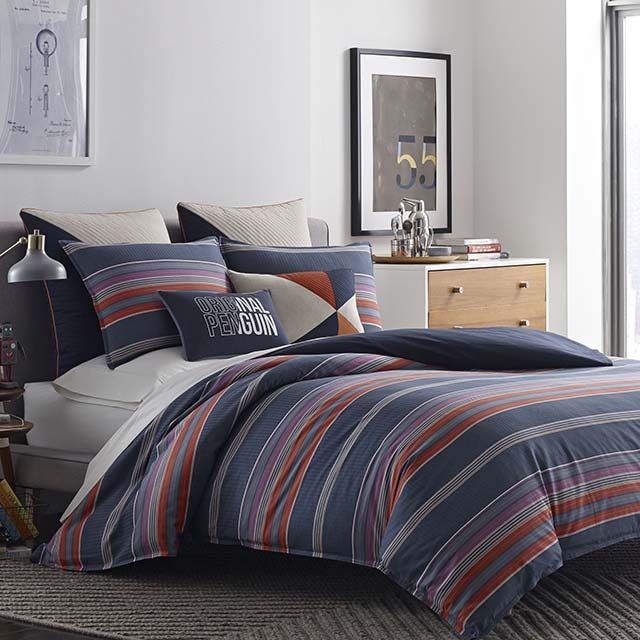 Noteworthy pieces are the beddings set and pillows printed with the iconic penguin logo of their famous golf shirt. Firma is one of the first elegant lifestyle stores in Metro Manila, and has been around since Greenbelt re-opened in the early aughties. The store still has the joie de vivre of a French flea market that other lifestyle stores try so desperately to achieve. From exotic local crafts, elegant side tables, occasional chairs, glamorous jewels by local and foreign designers, fedora hats, and their famous ostrich egg lamps, Firma goes around the world to scour the finest accessories fit for the modern-day gypsetter. Don’t miss their fabulous changing window displays. Stylish pieces, like flowing ruffled skirts and statement tops, are always on stock when you log on Seek the Uniq's website. 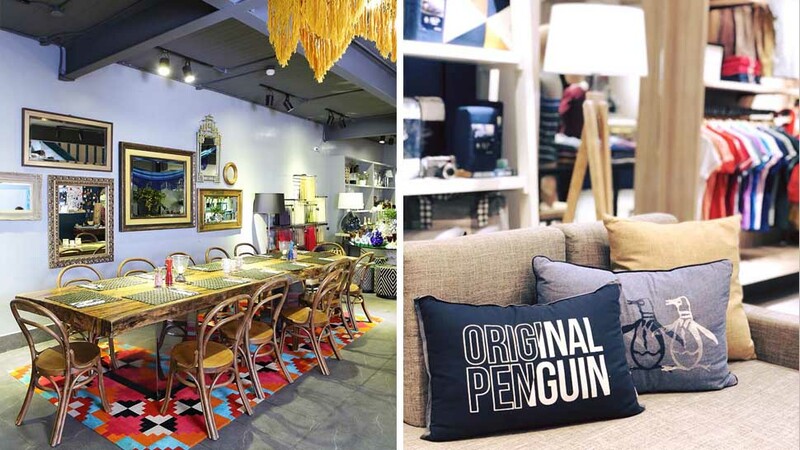 The lean team of Seek the Uniq is very good at curating chic items that go beyond the sartorial; they also have an assortment of pretty furnishings for your home—quirky napkin rings, woven throw pillows and linens, tropical-printed dishes, crocheted lamps, and even irresistible home scents, among others. The items are either sourced from various trips abroad or are inspired by these travels, with finds that are mostly boho. A piece or two will definitely perk up your nest! Visit seektheuniq.com or follow them on Instagram. This international brand has taken the country by storm, with branches that pop up practically almost everywhere. While H&M is known for its reasonably priced clothes, shoes, and other fashion accessories (the brand occasionally partners with haute couture fashion designers, too), its interior design and décor arm, H&M Home, is also a go-to store for anything home-related. Here, you can find storage bins and baskets, tableware, bed linens, throw pillow covers, T&B accoutrements, and an assortment of décor items. Collections change per season, so you’re assured that pieces remain au courant. Sale season is something you should keep an eye out for because prices are slashed up to 70% off! That means you can hoard all you want without hurting your wallet. Find H&M Home at U.P. Town Center, SM The Block, Robinsons Magnolia, all in Quezon City; Robinsons Ermita in Manila; SM Makati. Visit H&M's official website or follow them on Instagram. Homegrown bag label Aranaz, led by mother-and-daughter trio Becky, Amina, and Rosanna, has made the country proud with much recognition from international fashion magazines. In fact, the Queen of Belgium, Queen Mathilde, has been seen with an intricately designed Aranaz minaudiere on occasion. And with its specialty gift shop, Aranaz Tu, this famous local brand has made itself more accessible to the local market. Aside from gorgeous bags made of native materials, Aranaz Tu also carries classy desk organizers, woven floor pillows, chic note pads, printed storage boxes, and foldable lounge chairs. Don’t be surprised if you walk out the store carrying more than just one item. Visit Aranaz Tu at 4/L Mega Fashion Hall, SM Megamall, Mandaluyong City. You can also follow them on Instagram. Nava Boutique is home to trendy closet staples without the hefty price tags—most items on the racks are below P1,000! This local brand expanded to carry home décor pieces that are as affordable. Find rustic woodblock letters to personalize your space, bookends to organize your fave reads, wooden crates and wire baskets for storage, and small potted (faux) plants to add warmth to a vignette. Find Nava Boutique at Shoppesville in Greenhills, San Juan City; 2/L U.P. Town Center (New Wing), Katipunan, Quezon City; 2/L Fashion Market! Market!, Bonifacio Global City, Taguig City. You can also follow them on Instagram. You won’t miss this store, thanks to its eye-catching display window showcasing merchandise organized by color—nothing looks plain or bland. Quirky and colorful owl pillows with pompoms will definitely spruce up a plain couch. Victorian-inspired photo frames will add flair to your walls, while playful jewelry boxes will go well in your teenage daughter’s room. You can also find kitschy but fun gift items here. Find A'postrophe at G/L U.P. Town Center (Old Wing), Katipunan, Quezon City and L3 Glorietta 4, Ayala Avenue, Makati City. Shop online at shopee.ph/apostrophe_ph. You can also follow them on Instagram. 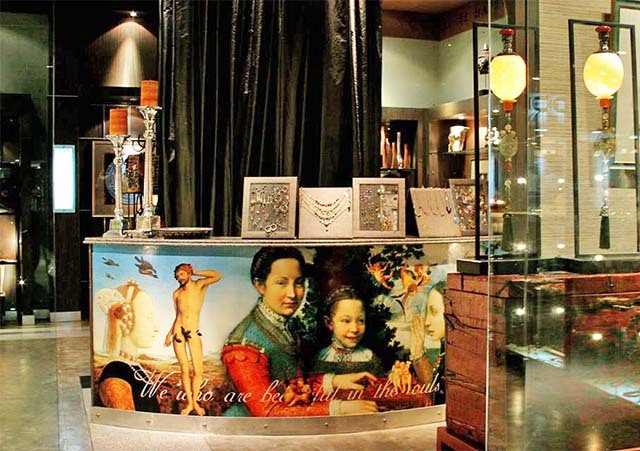 Classy, elegant jewelry takes center stage in this store. Cura V carries stunning pieces made of precious stones designed by local brands like Stockton Row, Tim Tam Ong, and DSV Design, among others. Its home décor items are equally sophisticated—metallic table toppers, pastel-hued entertaining pieces, and ceramic trays with gold handles are among the many that will add luxe to your home. Find Cura V at 2/L Power Plant Mall, Rockwell, Makati City. You can also follow them on Instagram. 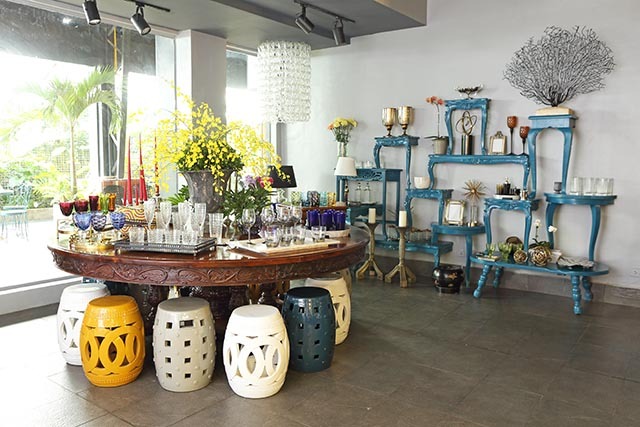 This sophisticated lifestyle shop (above and in main photo, left) tucked in hip and happening Karrivin Plaza has, for more than two years, successfully mixed fashion, home, and flowers. Their exuberant floral creations tower over cut-crystal décor, candles, carabao horn tableware, Tali Handmade bags by architect Lisa Salvador, Ken Samudio earrings, and more. Merely visiting the store is an experience unto itself.